Galaxy S9 rumour samsung The next Samsung, the Galaxy S9 ... maybe? The next Samsung, the Galaxy S9 ... maybe? So, there are some weird things going on in the atmosphere surrounding the next LG flagship, but put that aside as we're all steam ahead awaiting the launch of the next Galaxy device, ... you guessed it: the Samsung Galaxy S9. These sequentially named devices are starting to get boring, let's go to lineup names like cars do. Anyways, typically, Samsung announced the next device at the Mobile World Congress, which is coming up soon (end of February), so what are we expecting with the new device? 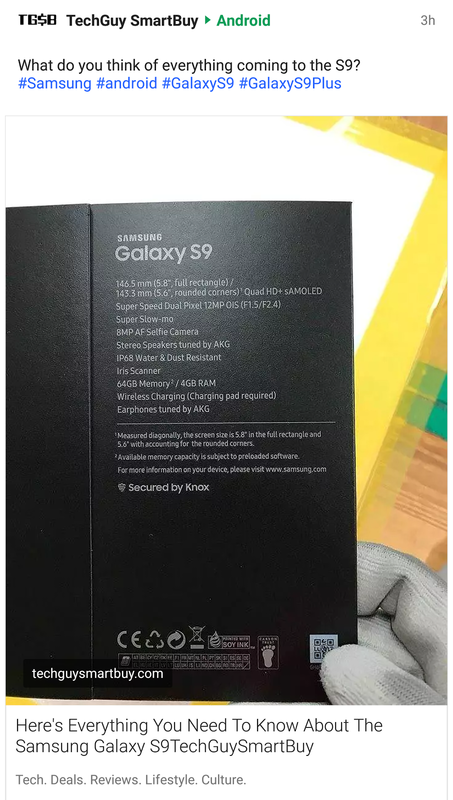 I saw over at TechGuySmartBuy his coverage of a reddit post showing off a photo of the box for the S9. Now, typically, I'm one to shy away from rumours and leaks, but this looks pretty damned legit. We also see it's got fast wireless charging, AKG speakers (not heard of AKG ... have you heard of Harman Kardon? Same 'family'). It's sticking with the Iris Scanner of course. The camera is looking to have the fastest aperture going, beating the LG V30 of f/1.6 by going to f/1.5. Also, it looks like it'll have SUPER SLOW-Mo. Now, there was some assumption in their post about it having the Snapdragon 845, and 3200mAh battery but that's just an assumption (I didn't find anything to point to more concrete speculation). But this could just be a 'mock up' of the retail box, so who's to say? Things could change between now and a month from now. Plus there's nothing about any new 'features'. I can't believe they'd only up the processor and the camera year over year. Samsung usually has something up their sleeve.